Q. Looking back on JAXA’s activity last year, what kind of year was it? First, let’s look at our space transportation systems. We safely launched two H-IIA Launch Vehicles, bringing our number of consecutive successful launches to 14. We have met the global standard of a 95% success rate, and demonstrated the H-IIA Launch Vehicle’s reliability. We also successfully launched our second KOUNOTORI space-station supply ship on an H-IIB Launch Vehicle, and berthed at the ISS. Development of the Epsilon solid-fuel rocket is also proceeding well, and it will launch according to schedule in 2013. As far as satellites go, we had positive results with MICHIBIKI, the Quasi-Zenith Satellite System (QZSS), which has started to transmit position signals. I believe this will help us decide whether we can transition to a new satellite positioning system that requires at least three satellites in the future. Meanwhile, unfortunately, we stopped operating DAICHI, the Advanced Land Observing Satellite (ALOS) in May. 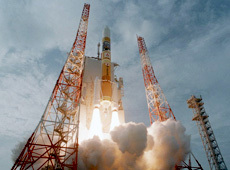 I think we can be proud of DAICHI because it surpassed its planned five-year operational lifespan by three months, demonstrating the high reliability of Japanese-made satellites. And although DAICHI is no longer operational, the vast amount of useable data it collected continues to be highly valuable. As the DAICHI project established a framework for the commercial use of its acquired data, for example by selling observation data, we plan to maintain and promote this framework. In space science, we have started analysis of the dust brought from the asteroid Itokawa by the HAYABUSA probe, and the initial results were featured in the American academic journal Science. I believe we will learn much more once we make the material more widely available to scientists, including researchers from around the world. The Monitor of All-Sky X-Ray Image (MAXI) - an array of cameras mounted on the International Space Station - started observations in August 2009. It’s already taken images of numerous supernova explosions, and we have received praise from around the world for recording so many observations in a short period of time. In addition, although the AKATSUKI space probe we sent to Venus failed to enter the planet’s orbit in 2010, we are continuing to work hard to make sure our second attempt succeeds. 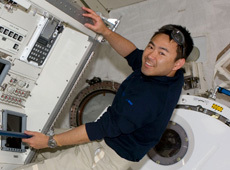 In the field of manned space exploration, we sent astronaut Satoshi Furukawa on a long-term mission aboard the ISS. Over five-and-a-half months, he conducted experiments on protein crystallization and other topics, while also performing medical tests in which he used his expertise as a physician. We expect the knowledge we’ve gained from medical experiments, such as those on remote medical treatment and osteoporosis prevention, to have further practical applications both in future long-term space missions and here on Earth. Also, representatives of many space agencies gathered in July to witness the final launch of the Space Shuttle. Although I regret that the Space Shuttle program has come to an end after 135 missions, I also feel that this is a call for Japan to actively develop new manned space-transport technologies. But of course, the event that had the greatest impact in 2011 was the Great East Japan Earthquake, which struck on March 11. We express our sympathy to those who suffered in the disaster, and our condolences to the families of those who passed away. At JAXA, although facilities at the Tsukuba Space Center and the Kakuda Space Center incurred damage, we had just implemented a Business Continuity Plan as a disaster measure, so we were able to set up a response headquarters an hour after the earthquake struck and react quickly. I also felt yet again that space technology is effective at times of disaster, because JAXA was able to contribute to the disaster response and assistance effort by providing satellites for communications and other needs. Q. What sort of disaster assistance did JAXA provide in the wake of the Great East Japan Earthquake? And what new disaster measures are you considering at JAXA as a result of the quake? The most important thing in disaster management is to have a clear understanding of the damage. DAICHI contributed to this understanding by taking around 400 photos of the disaster area and providing the images to the relevant personnel. We stopped operating DAICHI just two months later, so I feel that, given how useful it was following the disaster, there is an urgent need to launch its successor. We also used other existing satellites - the KIZUNA super-high-speed internet satellite and the Engineering Test Satellite VIII (KIKU No. 8) - to provide internet connections at evacuation centers and other locations in Iwate and Miyagi prefectures. It is vital to provide means of communication in a disaster area. Many people used the satellite links to verify the safety of family members, to collect information, etc. 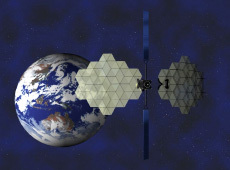 The earthquake made us think about how to use satellites to provide portable communications coverage during a disaster. The way to do that would be to make sure that regular mobile phones are able to communicate via satellite during emergencies. To accomplish this, we submitted a proposal to the government for a system that would install a large antenna on a satellite and use the same bandwidth as mobile phones on Earth. To obtain information during a disaster, making frequent observations over a wide area is equally as important as improving the precision of observational satellites such as DAICHI. After the Great East Japan Earthquake struck, only DAICHI was able to make observations that covered the entire expanse of the disaster area at once. JAXA has also used DAICHI to respond to disasters elsewhere in the world through international efforts such as the International Disaster Charter and Sentinel Asia, and such a contribution allowed us to receive many satellite images of the disaster-stricken areas taken by overseas satellites after that gigantic earthquake. Considering how important this contribution is internationally, we need to maintain systems that can help when disasters strike not only in Japan but also in other countries. Q. What objectives are you discussing with other space agencies for the ISS? Japan made a relatively quick decision to extend the ISS’s operating lifespan from 2015 to 2020. Since one of the major partners in the ISS, Canada, has yet to decide, we are still waiting for a final decision, but I expect that Canada will give its approval. So we’ve started considering specifics regarding how to use the space station until the year 2020. For example, the partner countries have all carried out their own experiments on the ISS, but some people have suggested scientific experiments with a unified theme, and Japan has decided to submit a draft plan. The Kibo Utilization Promotion Committee completed that scenario last year, so we plan to try to get our partners moving accordingly this year. The ISS has always been operated as a collaborative international project, so in the future I’d like to demonstrate this spirit in various ways. Q. 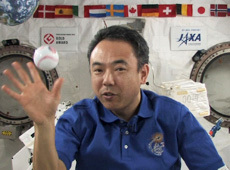 What initiatives is Japan planning for the ISS? We are now receiving help from outside experts to create scenarios for using the Kibo Japanese Experiment Module until 2020. 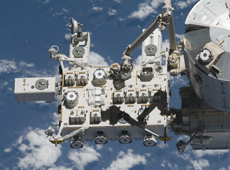 I’d like to produce results on the ISS as soon as possible, but we only completed Kibo in July 2009, so it’s been in operation for less than three years. Since research results aren’t produced that quickly, we are taking a long-term view, and hoping to produce as many results as we can by 2020. We also have to think about how we are going to transport people to the ISS in the future. We must continue sending astronauts to the space station because it is a very useful asset shared by all of humankind. Now that the Space Shuttle has been retired, our only way to send astronauts to the ISS is the Russian Soyuz spacecraft, so if the Soyuz has an accident then we’ll have no means of transporting astronauts at all. As we discuss how to secure transportation redundancy, people are looking to Japan’s KOUNOTORI space-station supply ship (also known as the H-II Transfer Vehicle, or HTV), which could be converted into a manned spacecraft. After the Space Shuttle’s retirement, KOUNOTORI became the sole transport vehicle capable of carrying heavy cargo to the ISS, but currently it is a single-use vehicle, burning up when it reenters the atmosphere. So KOUNOTORI cannot bring back samples from completed space experiments or anything else. That’s why we are currently proceeding with research on an HTV with additional retrieval function (HTV-R), which we plan to have ready in about five years. 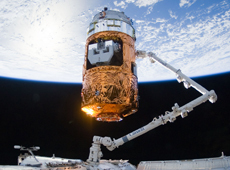 If we can make the HTV retrievable, then it must be expected for us to turn it into a manned spacecraft, too. However, the decision on whether or not Japan goes ahead with this rests with the Japanese government. So before we move in that direction, the government has to give us the go-ahead. Personally, I think that if we continue to cooperate with the international community in space, our partners will ask Japan, a country with a highly developed space program, to help build an infrastructure for manned space transport. This is another reason why I believe that we should develop a made-in-Japan manned spacecraft.